(Bloomberg) -- President Donald Trump got a warning sign on Tuesday from the Midwestern and Rust Belt states that handed him the presidency, as voters delivered big victories to Democrats and offered a road map for the crowd of candidates lining up to challenge him in 2020. 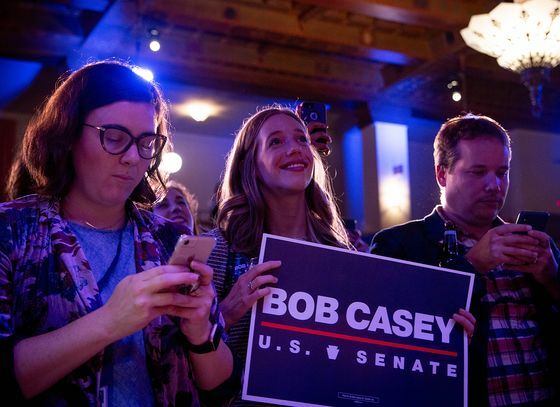 Pennsylvania Senator Bob Casey and Governor Tom Wolf cruised to re-election. Michigan’s Gretchen Whitmer won the governorship and Senator Debbie Stabenow, a member of Minority Leader Chuck Schumer’s leadership team, was re-elected. Wisconsin Senator Tammy Baldwin won her race running on an unabashedly liberal platform, while Democrat Tony Evers was declared the winner over Republican Governor Scott Walker. In 2016, Trump lost the popular vote to Hillary Clinton, but he won presidency with victories in those three Democratic-leaning states by a total of less than 80,000 votes. A Democrat who can hold Pennsylvania, Michigan and Wisconsin and their 46 Electoral College votes in 2020 along with the states that Clinton carried would win the presidency. Democrats also won governor’s races in Illinois and Minnesota while both Democratic senators from Minnesota won re-election. Meanwhile, Ohio, a state that Trump won by 8 points and elected a new GOP governor, but also re-elected Democratic Senator Sherrod Brown. 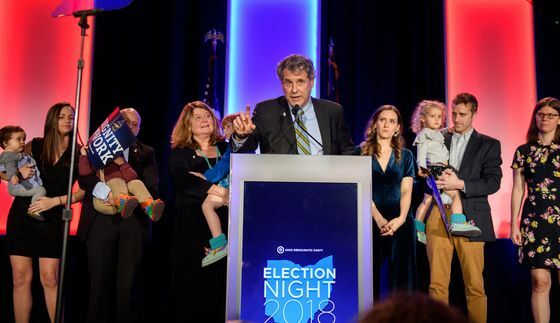 "We will show America how we celebrate organized labor and all workers - the waitress in Dayton, the office worker in Toledo, the nurse in Columbus, the mineworker in Coshocton," Brown said. "That is the message coming out of Ohio in 2018, and that is the blueprint for our nation in 2020." For Democratic voters likely to face a large and diverse field of presidential candidates in 2020, a central question is which one of them can resurrect the vaunted Midwestern “blue wall” that Trump cracked in 2016. The question looms larger after Democrats suffered stinging disappointments in Florida — a perennial swing state rich with electoral votes in presidential elections — in races for Senate and governor on Tuesday. That means deciding whether to pick a candidate who’ll run on an ideologically progressive platform and try to expand the electorate by mobilizing non-traditional voters -- much as Obama and Trump did -- or to select a candidate who’ll seek distance from the Democratic base and appeal to middle-of-the-road voters. The 2018 election cycle revealed a rapidly changing party to which 2020 presidential aspirants will have to appeal. Democrats showed they want leaders who look like the party’s ascendant base of younger, nonwhite and female voters. 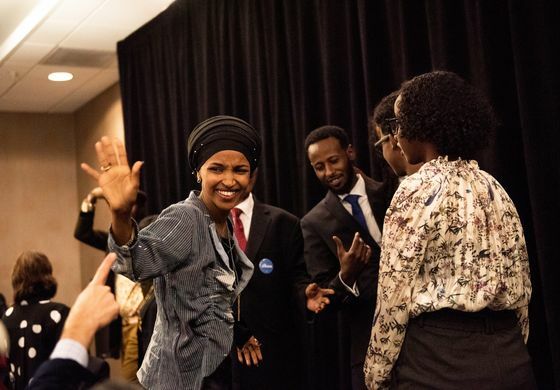 Democrats sent the first two Muslim women to Congress in in Minnesota’s Ilhan Omar and Michigan’s Rashida Tlaib. So far, possible 2020 contenders include former Vice President Joe Biden, Senators Elizabeth Warren of Massachusetts, Kamala Harris of California, Cory Booker of New Jersey, Kirsten Gillibrand of New York and Bernie Sanders of Vermont; mayors or former mayors like Eric Garcetti of Los Angeles, Julian Castro of San Antonio, and Michael Bloomberg of New York, the founder and majority owner of Bloomberg LP, the parent company of Bloomberg News; and governors like Colorado’s John Hickenlooper. Democratic hopefuls will have to balance that with a need to keep the flank of the party in the fold. West Virginia Senator Joe Manchin and Montana Senator Jon Tester won re-election in red states. A swath of House Democrats in GOP-leaning districts won in competitive parts of the country that haven’t traditionally supported liberal ideas. The Democratic takeover of the House will give party leaders power of the purse. It’ll also give them the power to decide what bills get to come up for a vote — which, if past is precedent, they’ll use to draw contrasts with Republicans. They’ll also have the new powers of investigation, and House Speaker-in-waiting Nancy Pelosi suggested they’ll use it. "It’s about restoring the Constitution’s checks and balances on the Trump administration," she said in a victory speech Tuesday night.